* China agreed to expand imports to fix the trade imbalance. The two sides also agreed to open markets to each other. 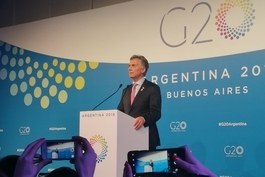 (Buenos Aires) — China President Xi Jinping and U.S. counterpart Donald Trump agreed to put threatened new tariffs on hold and keep negotiating a trade pact, following a dinner in Buenos Aires to address their trade conflict that many worry could dampen global economic growth. 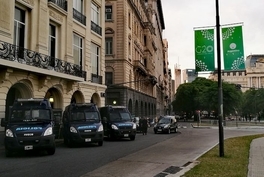 After their two-hour meeting at the Duhau Park Hyatt in the Argentine capital, the two presidents, accompanied by senior aides, agreed not to implement additional tariffs after Jan. 1 as talks continue, both sides confirmed. “China agreed to expand imports based on domestic demand, including American products, to fix the trade imbalance,” Foreign Minister Wang Yi said at a briefing after the event, referring to China’s large trade surplus with the U.S. that is one of Trump’s major complaints. “The two sides also agreed to open markets to each other. The legitimate concerns of the U.S. side will be addressed as China enhances reform. The two sides will follow up with negotiations to work toward elimination of all the tariffs,” he said. China and the U.S. also agreed to enhance cooperation on law enforcement and combating illicit drugs, including the synthetic drug fentanyl, said Wang. A White House statement called the meeting “highly successful,” saying China has agreed to buy a “very substantial amount of agricultural, energy, industrial, and other product from the United States” to reduce its trade surplus with the U.S.
“President Trump and President Xi have agreed to immediately begin negotiations on structural changes with respect to forced technology transfer, intellectual property protection, non-tariff barriers, cyber intrusions and cyber theft, services and agriculture,” the White House statement said. The Trump administration was scheduled to increase punitive tariffs on $200 billion worth of Chinese imports from a current 10% to 25% on the first day of 2019. It has also threatened new punitive tariffs on an additional $260 billion in Chinese goods. China has pledged to hit back with reciprocal measures on its U.S. imports. 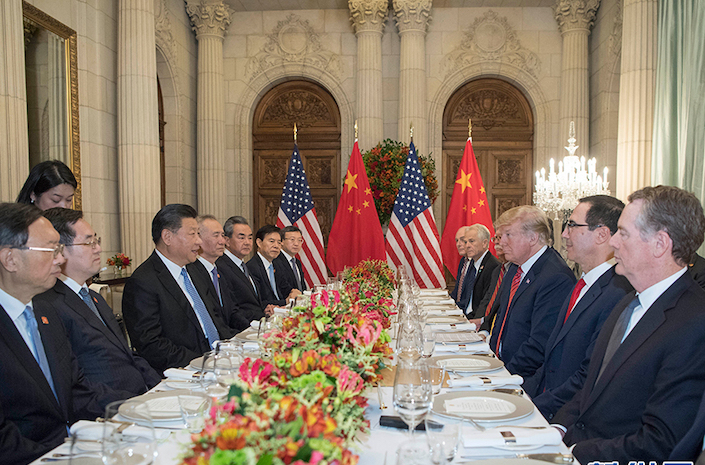 Xi and Trump sat down for dinner at around 5:30 p.m in Buenos Aires following a two-day summit of the Group of 20 countries, where their meeting was one of the most closely watched events. That meeting lasted about two and a half hours. Trump was accompanied by an 11-member delegation including Secretary of the State Mike Pompeo, Treasury Secretary Steven Mnuchin, Chief of Staff John Kelly and Trade Representative Robert Lighthizer. Xi’s delegation included Ding Xuexiang, director of the general office of the Communist Party’s Central Committee; Vice-Premier and chief economic advisor Liu He; Yang Jiechi, director of the secretariat of the Communist Party’s Central Leading Group on Foreign Affairs; and Wang Yi, according to the White House release. Trump was set to fly back to Washington following the dinner, while Xi stayed in Argentina for a state visit. China and the U.S. have been locked in a bitter trade war for much of this year, largely led by Trump, who has accused Beijing of unfair policies like forcing technology transfers and stealing U.S. intellectual property. Since July, Trump has imposed punitive tariffs on $250 billion of Chinese imports, prompting China to retaliate with tariffs on $110 billion of American goods. The tensions have taken a toll on the global economy, with the International Monetary Fund downgrading its global trade outlook for this year and next. In its latest trade indicator findings published last week, the World Trade Organization warned trade growth is expected to slow further into the fourth quarter of 2018. The proposed 25% U.S. tariffs could shave 0.8 percentage points from China’s gross domestic product growth, and uncertainties related to the trade war will have a long-term impact on business investment decisions and global supply chains, investment bank UBS said in a recent report. For the U.S., an intensified trade war probably is more damaging than many recognize, warned JP Morgan Asset Management Chief Global Strategist David Kelly in a recent research note.